Apprising Ministries has been busy documenting for you the very rapid penetration of apostasy into the heart of the mainstream evangelical community—particularly in its younger sectors—because of its ongoing embrace of the sinfully ecumenical neo-liberal cult of the Emergent Church aka the Emerging Church. You really need to know that those spreading rumors of its demise are woefully misinformed. The EC hasn’t died; it’s morphed into the Emerging Church 2.0 with its own postmodern Progressive Christian theology. These rebels against the final authority of the Word of God will often refer to under their silly circus “big tent” as Emergence Christianity. At the core of this lunacy in the Lord’s name is its highly subjective Contemplative Spirituality/Mysticism (CSM) ala Living Spiritual Teacher and Quaker mystic Richard Foster and his spiritual twin Dallas Willard. It’s simply beyond question that a leading spokesman for all of this is the Emerging Church rock star pastor Rob Bell, whom you may know is a co-teaching pastor at Mars Hill Bible Church (MHBC) along with his good friend, the heretical Shane Hipps. By all of this, I mean both CSM and the postmodern form of liberal/progressive Christianity—Liberalism 2.o—because Bell is heavily involved with both. Let me remind you that his mentor Living Spiritual Teacher and EC guru Brian McLaren  laid his progressive/liberal cards on the table with his tome A New Kind of Christianity; therein this heretical wolf in sheep’s clothing openly confessed his version of progressive Christianity. It was a way for leaders in this EC cult to test the waters to see just how far they could push heresy while remaining mainstream; as we would come to find out, all the way to pagan universalism. 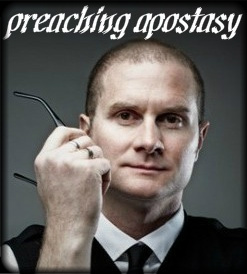 Now Rob Bell has finally become emboldened enough to follow suit with his own Love Wins mythology. However, two years ago in Rob Bell And Christian Universalism I showed you that this was what he has been arguing for all along. How did I know you ask; simple. I saw that Bell has himself been practicing mysticism, as well as teaching it to his infamous MHBC community, since at the very least 2001; and that’s where all mystics will eventually end up. I also have in my possession, from a source who once attended MHBC, the text from an apparently unpublished plastic spiral booklet from that year by Bell. This work is entitled The Sound of Sheer Silence; and essentially forms what would go on to become much of the text for his 2005 Nooma DVD Noise below. In recent pieces like Word Faith Heretic Cindy Trimm Receives Award From Billy Graham Evangelistic Association I’ve explained to you that the crown jewel of this spurious CSM is a form of meditation while in an altered state of consciousness commonly known as Contemplative/Centering Prayer (CCP). If you didn’t know, you need to realize that this is what all the talk about spending time in “silence” is really all about; it’s mystic-speak for the practice of CCP. O, in the Lord, how I wish these perverted purveyors of this mysticism-lite would follow their own advice and remain in silence. However, such as these persist in their public propagation of pietistic and ascetic “spiritual disciplines,” which flowered in the antibiblical monastic traditions that would produce the theology of apostate Roman Catholicism. I’ll also point out that those who persist in the prolonged practice of CSM, like Rob Bell, eventually receive a delusion that God has some “dream” to make the world a better place by bringing all factions of Christianity together as one. Seriously, even in as short a time period as a couple of years ago, who would ever have thought that the secular song Imagine, John Lennon’s anthem to the love of the self (cf. 2 Timothy 3:2), would become evangelical Christian doctrine. Yet for the really deluded ones like EC pastor Samir Selmanovic this depraved dream would actually include all religions; think I’m kidding, see for yourself in Emerging Church Leader Samir Selmanovic Worships With Witches. Then in the Love Wins mythology of Rob Bell, we now even see that postmortem, after some kind of a Protestant purgatory, this would eventually include all of mankind. I’m not being harsh and unloving Mart De Haan of Radio Bible Class; and it’s well past time for you to take your nose out of Henri Nouwen and man up. I’m being throughly and consistently Christian here; and after-all, I didn’t say it, God did. Sadly, at this critical time in church history, what we’re witnessing is a rather nauseating display of pathetic Protholic evangelical leaders so scared of their own spiritual shadows, and too timid to defend the purity of God’s Gospel, to throw this apostate out of the Lord’s church where he belongs. You’d best believe that if Arius suddenly arises today, in short order you’ll be worshipping God right alongside Jehovah’s Witnesses as your fellow evangelicals. So, against this proper framework I’m pleased now to point you to the following from Dr. John MacArthur, a man to whom I raise my Sword of the Spirit for having the spiritual intestinal fortitude to boldly speak the truth concerning the heretic Rob Bell. You see, for years now I have carefully studied the mythology of Rob Bell, as clear a fulfillment of 2 Timothy 4:3-4 as it gets. It’s a fair—and necessary—question. Christ’s famous warning about wolves in sheep’s clothing is given to us as an imperative: “Beware of the false prophets, who come to you in sheep’s clothing, but inwardly are ravenous wolves. You will know them by their fruits” (Matthew 7:15-16). Our Lord clearly expects His true disciples to be able to spot spiritual imposters and wolves in sheep’s clothing—especially those who are purveyors of deadly false doctrines. Back to note 1 — You can follow some of the corrupting results of this spurious CSM as well as how far its spread already e.g. in Contemplative Spirituality Growing Within Mainstream Evangelicalism and Lifeway Encouraging Southern Baptists To Practice Lectio Divina. Back to note 2 — McLaren comprises the unholy EC trinity of apostates along with Doug Pagitt, heretical universalist pastor of Solomon’s Porch, with the third member being his progressive/liberal “theologian in residence” and Fuller Theological Seminary professor Dr. Tony Jones. Back to note 3 — Rob Bell, Velvet Elvis: Rethinking the Christian Faith, [Zondervan: Grand Rapids, 2005], 146, emphasis mine.